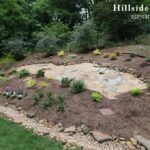 Last summer we embarked on a big landscaping project for our hillside and we continued this spring by adding more plantings and expanding the bed. 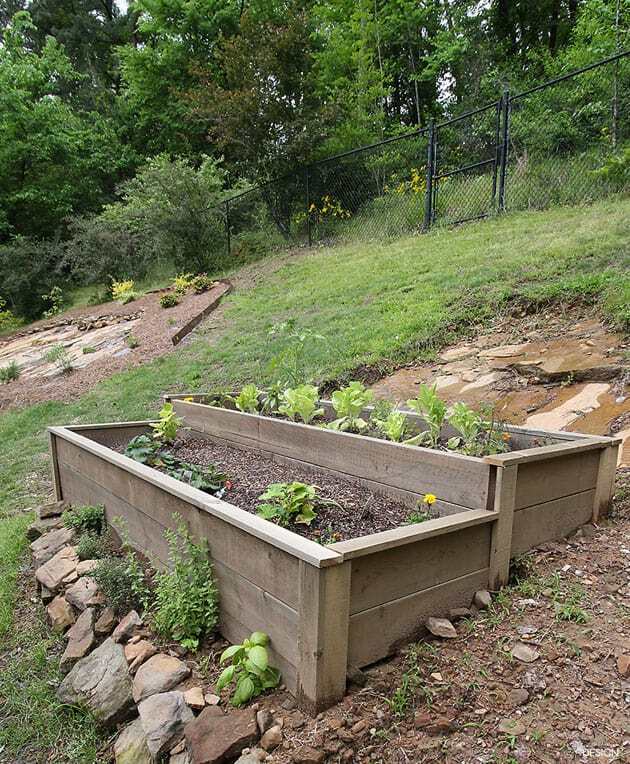 You can read all about our creating a hillside garden here and then an updated post here. Obviously, this is a huge transformation from the barren slope we found when we moved here. 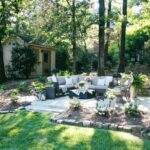 If you’ve got a yard like this but don’t have as much experience landscaping as we do, you might need a landscaping company like Growing Solutions (https://www.growso.com/) to help you with a few things to make sure it looks good. 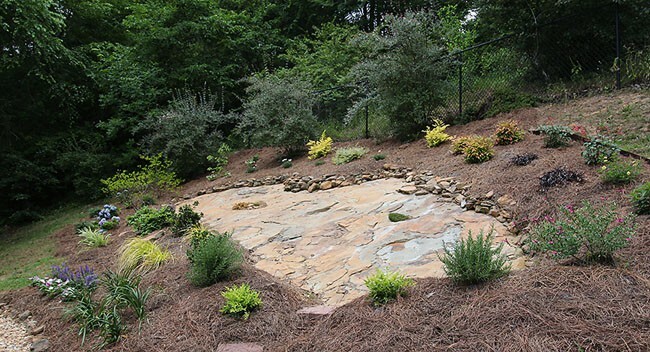 We have quite a lot of experience with landscaping so now it’s a completly landscaped backyard featuring the uncovered rock, stacked rock and beautiful plants, most of them from Southern Living Plant Collection. 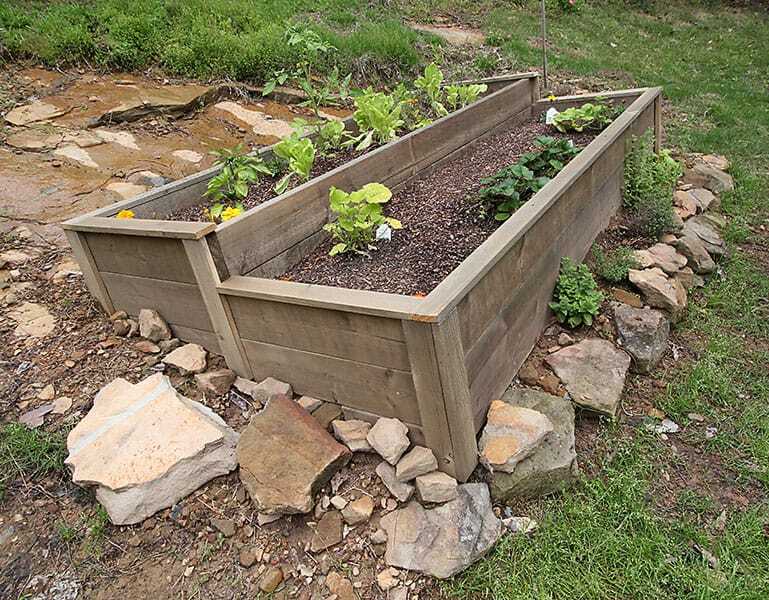 Now that we had the “beauty” part of the yard covered it was time to add some function by adding a raised bed kitchen garden. I have had my share of summer gardens now and just love being able enjoy fresh salads filled with cucumbers and tomatoes, zucchini and herbs straight from my own backyard. Home grown truly is better. And best of all, you know exactly where it came from! 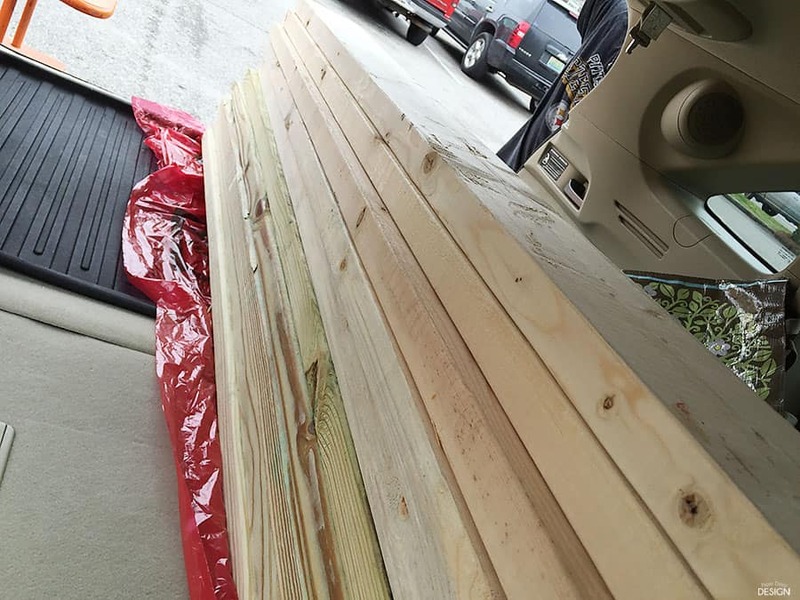 So, after filling our car with 2x6x8 lumber boards, I washed all the boards with the treatment. My poor small SUV gets treated like a truck often. 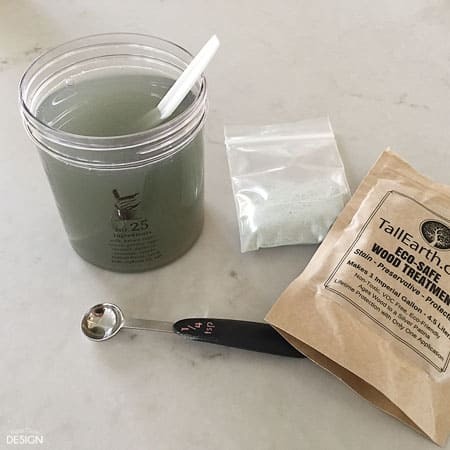 I mixed up 1/4 teaspoon with 1 pint of water, following the directions, but in smaller quantities. I did have to mix up one more batch to treat the trim pieces later. Applying the solution was quick and easy. 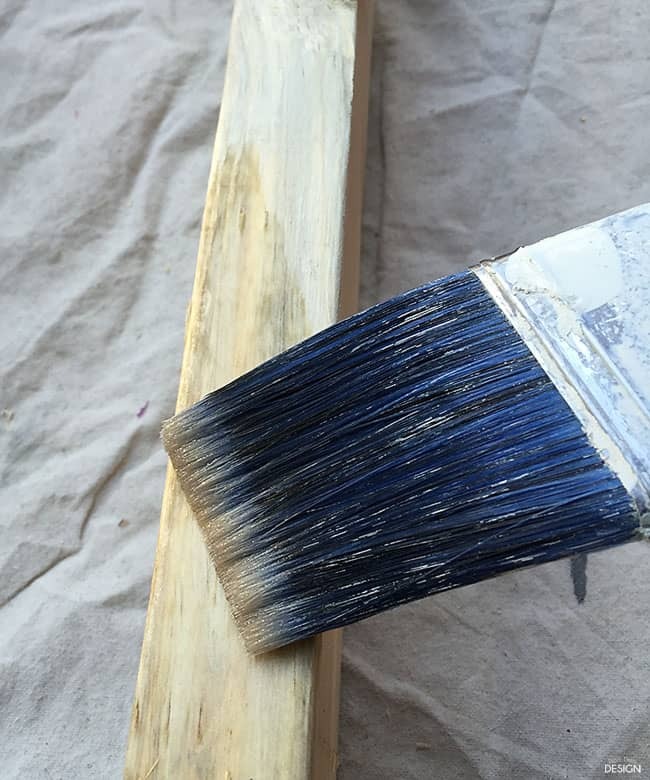 Wash it on with a clean brush and let it dry to a nice slivery finish. 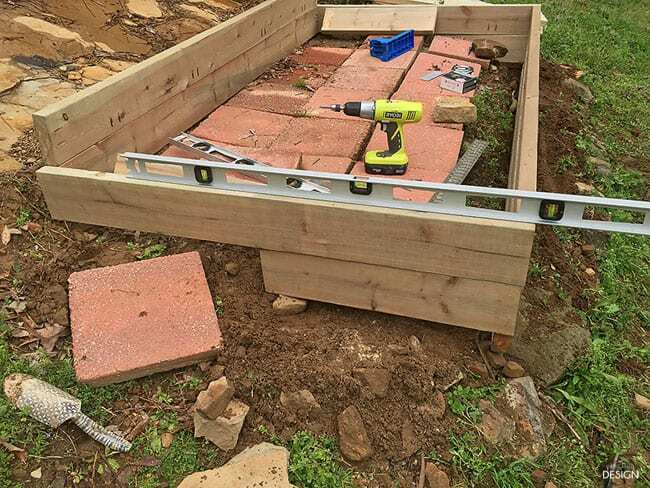 The next day we got busy with the construction of our two tiered raised bed. Building it in two levels generally allows you enough of a rise to accommodate a sloped yard. 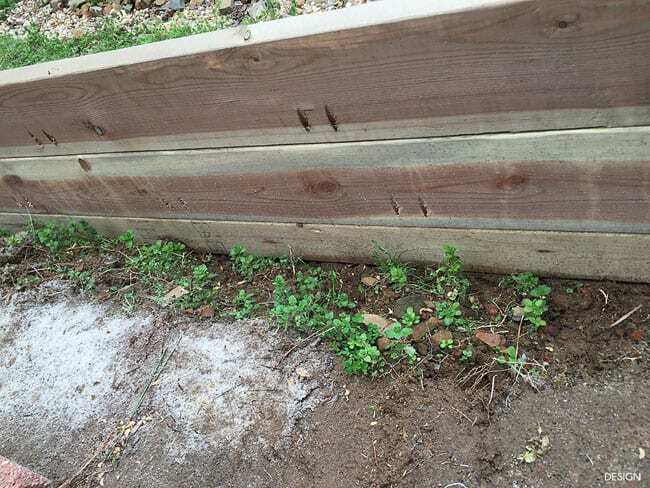 We soon discovered that in our case, we needed to add extra boards for the severity of our slope. 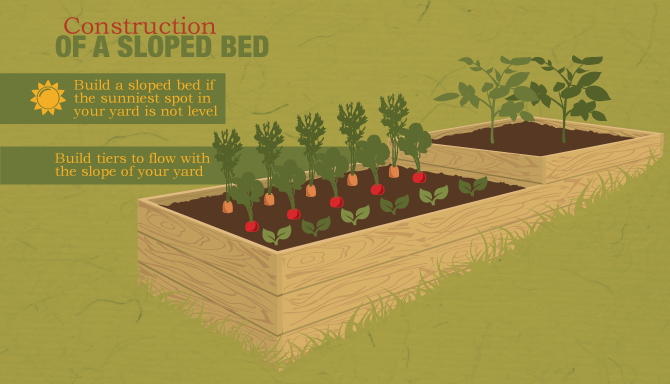 Here is a great graphic I found for the traditional look of a sloped raised bed. 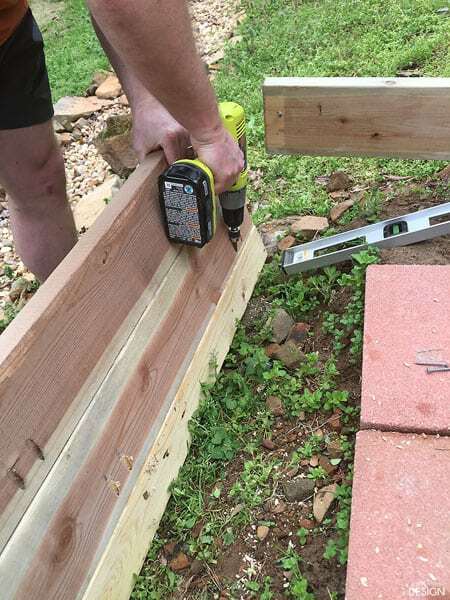 Knowing that we were just inches above rock and would have very little actual ground to stake into, we used the Kreg Jig to make pocket holes to join the layers of wood together for added strength and stability. 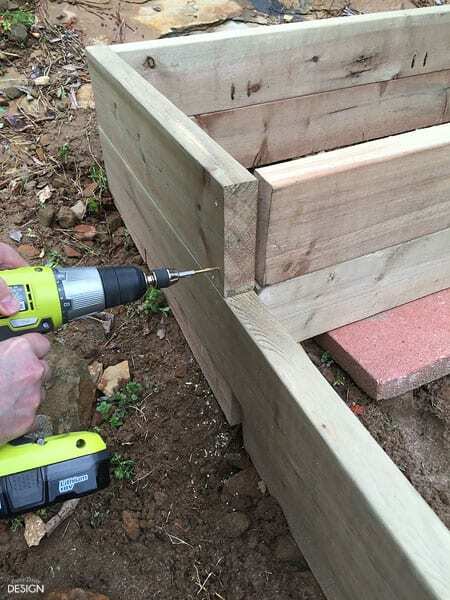 This joinery below will become the front and the sides of the raised bed box. Once we got the front and the top side boards screwed together, we added in the back boards. 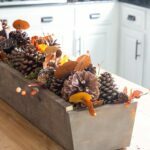 The side board connects at the top of the front and the bottom of the back, kind of like stairs. Be sure to check for level from front to back. 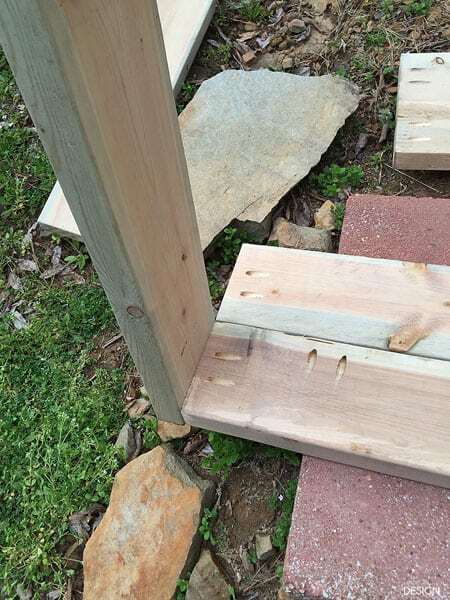 We had to support the board with other pieces of wood and rock during the initial building process. You may need to dig out dirt to bury your boards a bit to get the proper alignment. For us, we dug out mostly from the front. Like I said, most raised beds do not have to be as tall as two and one-half boards, but to accommodate our severe slope we had to add an additional board. After the first board was level, we added in the second side board underneath. 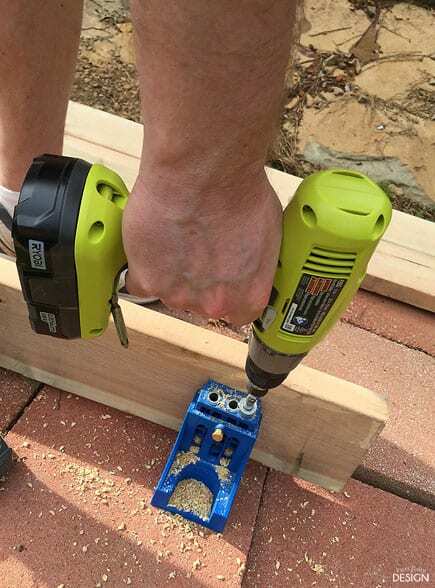 Because we had not realized we were going to need a third board for support, we just used the Kreg Jig in place to drill more pocket holes to attach the last side board. Right after we did this it began to rain, so I don’t have a photo of the addition of the top side board. Here we have all the pieces level and in the proper place, ready for the final securing screws. 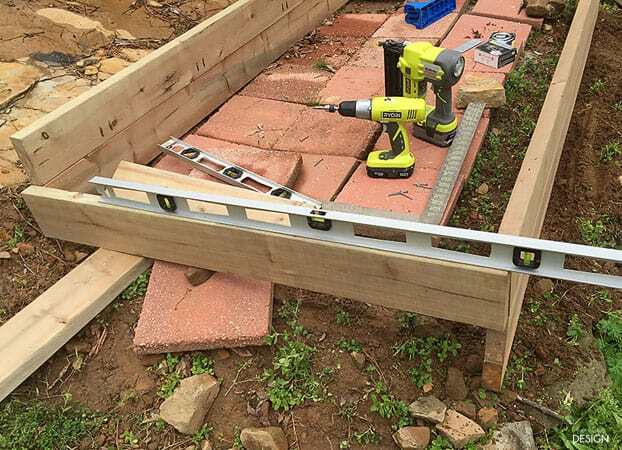 This photo shows the full length of the center boards that divide the lower and top beds as well as that third support board we added to the bottom. 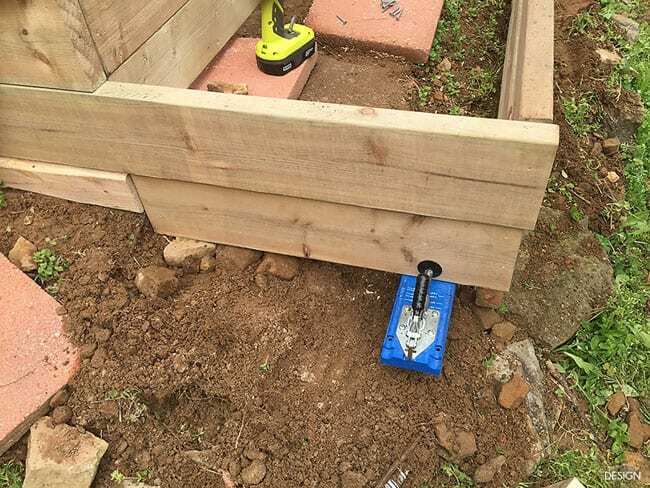 Traditionally, gardeners use wooden stakes at the corners, but we had very little soil to drive into before we hit solid rock, so we used small garden stakes attached to the bottom side boards with screws. 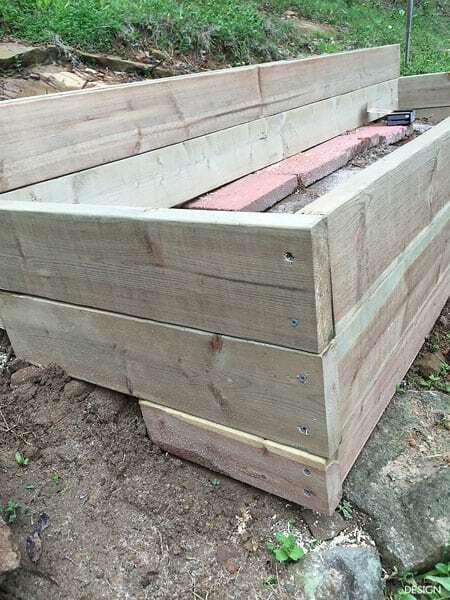 To give a more finished look to the raised bed, after the bed was complete, I added 1x2x8 pieces of cedar, also treated with the Eco Finish. 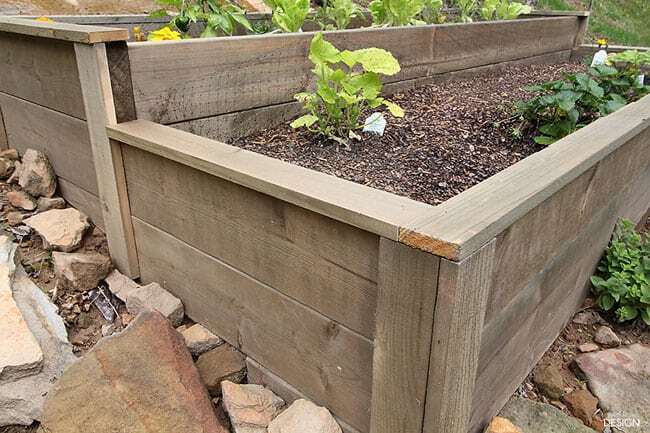 These purely decorative boards were used to cover the screws that hold everything together and provide a small ledge to lean on while harvesting or to place a garden tool. 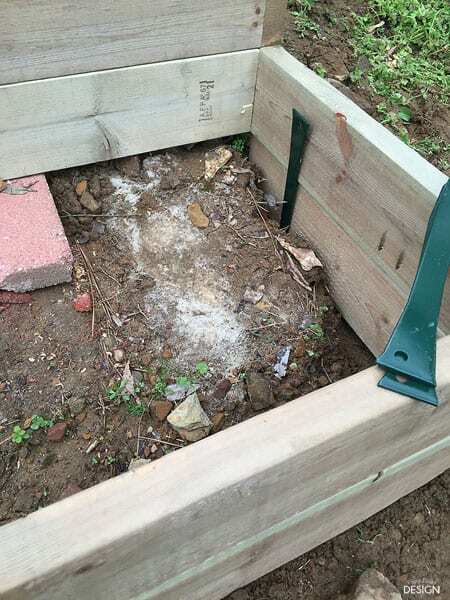 Because the raised bed is rather deep, we filled the bottom of the box with leaves and topped it with newspaper. Then we added in our organic gardening soil. Next year, we can turn over the dirt and the paper and leaves will have decomposed. 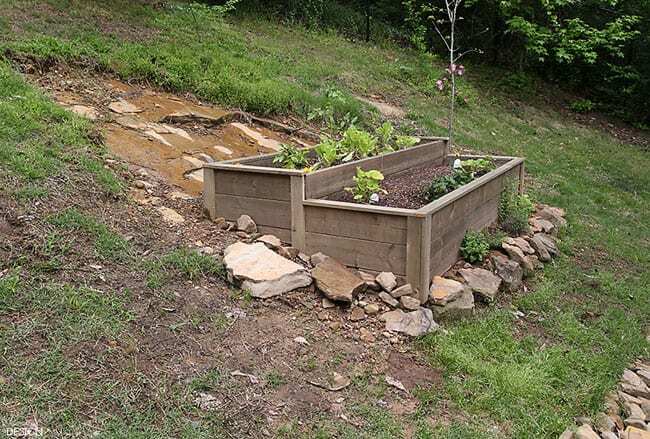 To enhance the look of the bed, we also gathered rocks from the wooded area of our yard. 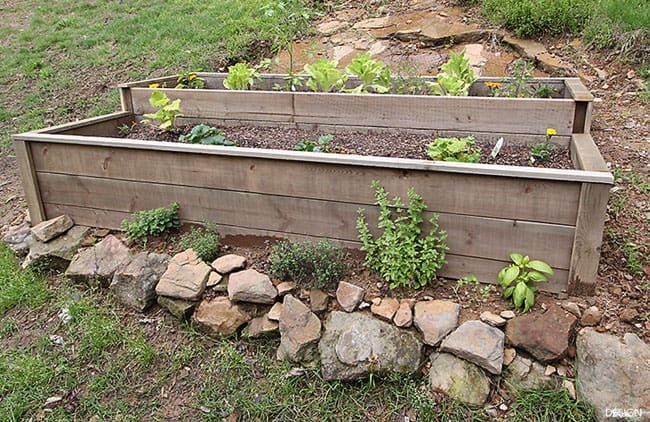 The rocks along the front also create a little retaining wall for the herbs. While building a raised bed garden on a slope has it’s challenges, it’s totally worth the effort when you can harvest your first cherry tomato and slice the first cucumber. 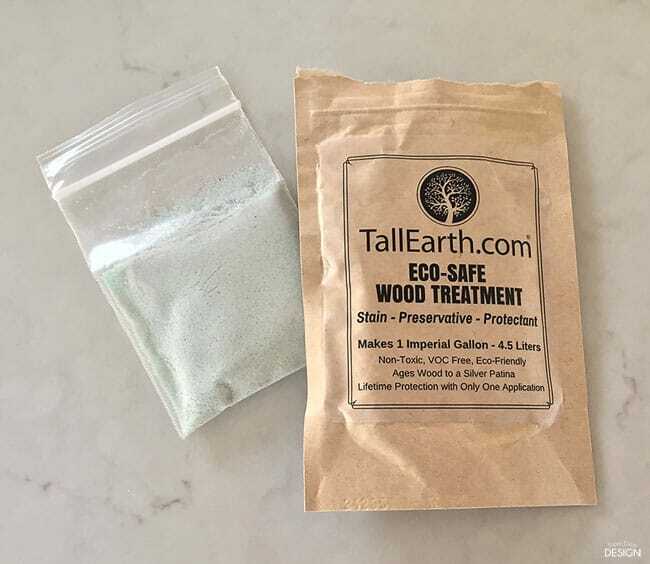 Knowing that everything we used was safe and as natural as possible, gives me peace of mind. Knowing that our handy work will last for many years makes me enjoy it all the more. Of course since these photos were taken several weeks ago, the plants are filling in and yielding fruit. Yum! 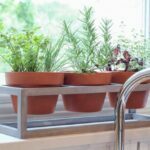 So, I’d love to hear from you, how’s your garden growing this summer? There’s still time to get started if you haven’t already. 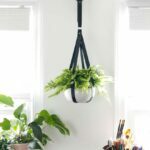 This is definitely a simple weekend project.